Manali- the valley of Gods is a honeymooners’ paradise, adventure junkies’ heaven, trekkers’ adda, Manali has something for everyone who comes here. It is a year round magnet – a destination that never sees a dry spell of visitors flocking from not only India but around the world. Manali Backpackers is a one stop destination for all your travelling needs to Manali- be it a honeymoon package, Adventure tour or trekking and paragliding. The ease of booking online and then affordable pricing is what makes Manali Backpackers a go to tour operator. The stunning Dhauladhar mountain ranges forming the backdrop and the gushing river flowing through the green valley, all this make Manali a perfect getaway destination. Slowly but steadily, Manali is gaining popularity as a promising hub for the adventure activities like paragliding, skiing, zorbing, snorkelling, river rafting etc. River rafting in manali particular is a one such adventure sport that is thrilling and full action. You have to be on your toes when you are amidst water. Learn the basics, how to manoeuvre the raft, know your teammates, for river rafting is all about great team work. While you embark upon a river rafting expedition, enroute you can catch a glimpse of the lofty snow capped mountains and soak yourself in the cascading Beas River. Beas river is a haven for the water sports like river rafting, kayaking, canoeing. The rafting starts from Manali and goes until Bhuntar in the Kullu district. They are two options to choose from: Short and long rafting. Short rafting goes for 7 Km and while long rafting goes until 14 Km. You can choose them as per time availability, budget and the thrill level you want to experience. The packages offered by Manali Backpackers for rafting and camping start from as low as Rs 2500 per person and are inclusive of Map plan, bon fire and fishing. We booked online and were delighted to see that the team is highly experienced and gives you training on every small and big aspect of the adventure sport you wish to take in. 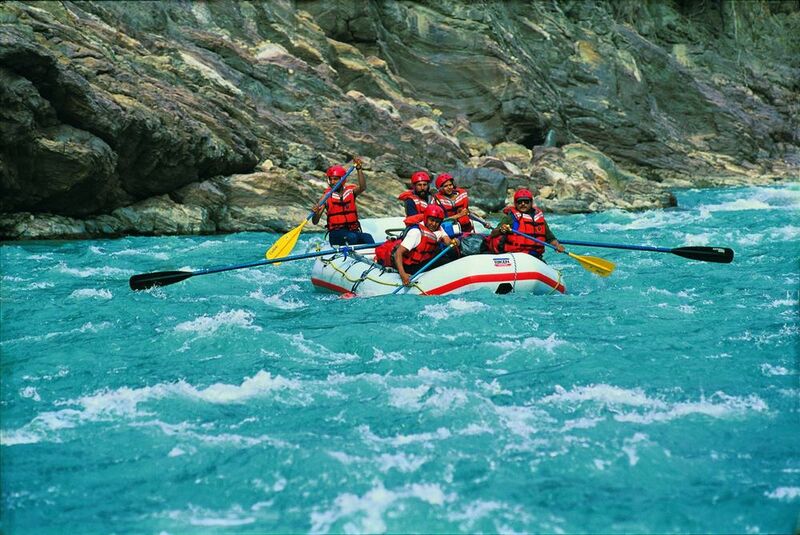 The white water rafting at Kullu is the most loved and the most sought after. It is simply thrilling when the water comes rapidly after striking from the trees at the banks of the river. Bijli Mahadev is another famous spot among the rafting enthusiasts. While you enjoy rafting in Beas, you pass by some beautiful sights making the rafting experience a memorable one. In the evening, you can camp along the riverside and indulge in Bonfire activities like dancing and singing. The next morning you can offer prayers at the Bijli Mahadev Temple and admire the stunning views of the Kullu and Parvati valleys. Rafting at Pirdi near Kullu is another once in a lifetime experience perfect for the beginners and for the experts too. The raging water waves when they come splashing at your face, your adrenaline junkie just comes to the core to give a strong fight. The rafts and the other equipments all are tested and meet the international safety standards and experts are always around the corner thus keeping the safety of the people intact. Manali is truly an adventure spot loved and admired by adventure junkies all around the world. So, if you are the one who loves adventure sports, do come and fall in love with what Manali has to offer you! Manali Backpackers will make your adventure trip more comfortable and memorable.